Stopping at the threshold of Laurent’s, what first greeted us wasn’t the service staff nor the “Plz wait to be seated” sign, rather it was the wafting aroma of to die for dark chocolate and like sailors to a siren’s song, we were lured into the abyss, the dark abyss of sore throat inducing chocolate paradise. Al fresco is definitely condusive for people watching, especially at night in this part of town where the young at heart wonder about in their hip get-ups and sassy clubbing attires. 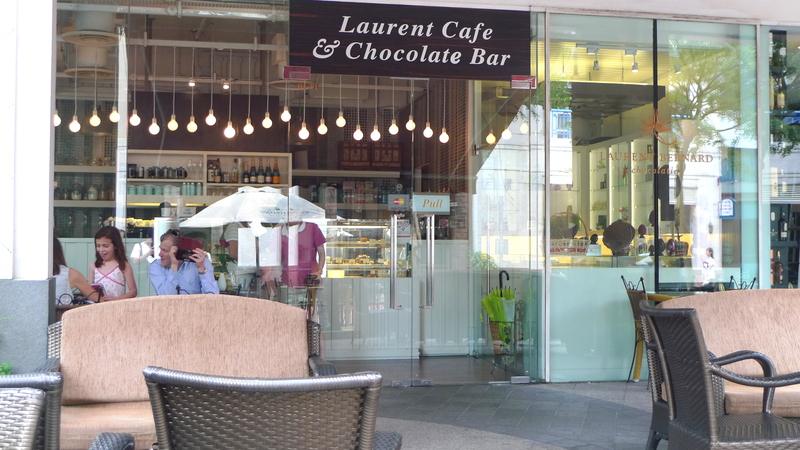 After an extremely heavy meal at Sun with Moon, I suggested that my ex-jc classmates try out Laurent’s since none of them had patronised said chocolate bar before and we needed somewhere to sit down and catch up anyways. Chef Laurent continually strives to improve and tweak each and every of his recipes or so they say, but here it is, concrete pictorial evidence! 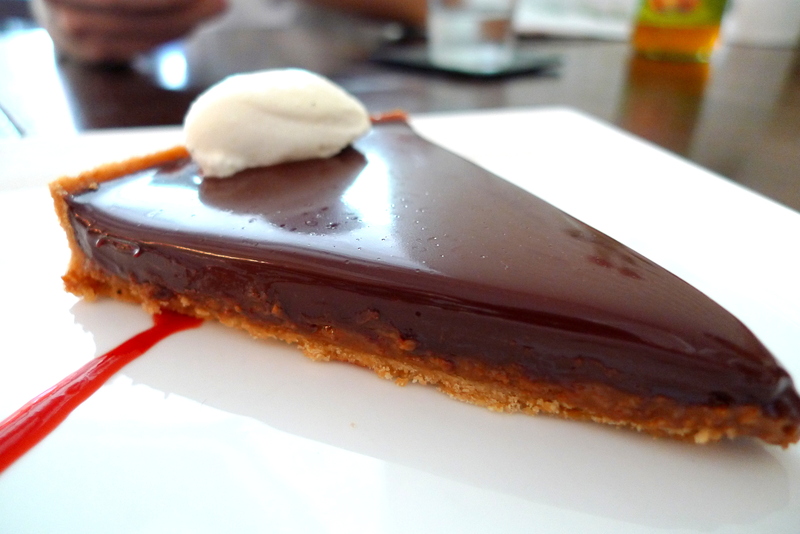 The evolution of the Crispy Chocolate Tart($6.80++) over the past year. I would have scored the “original” Chocolate Tart a 10/10 already so when I saw that there was a new version, I was a little apprehensive. Why would he want to compromise on something that was already perfect(in my eyes)? Fortunately, I felt that the latest version is just as good as it’s predecessor, just some minor modifications to the tart base and shape. The Dark Chocolate is still as heavenly as when I first laid my tastebuds on it. 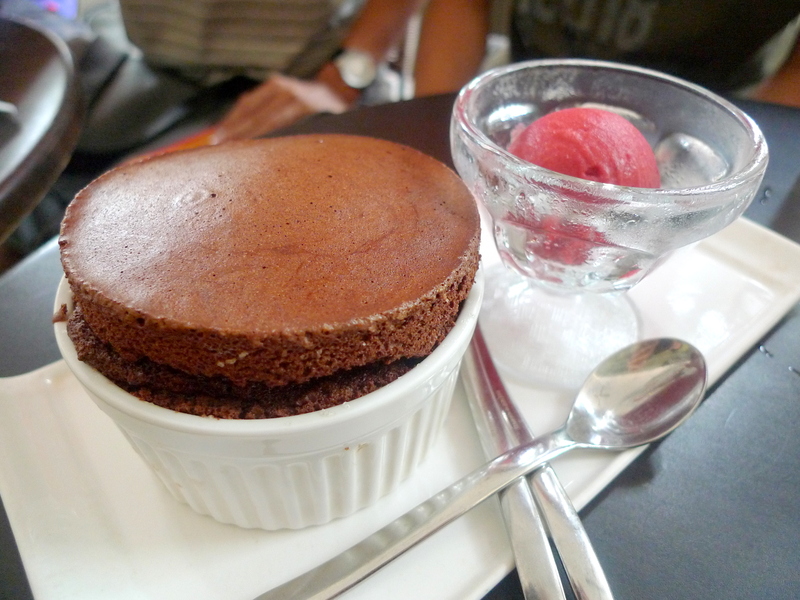 I don’t really appreciate souffles. 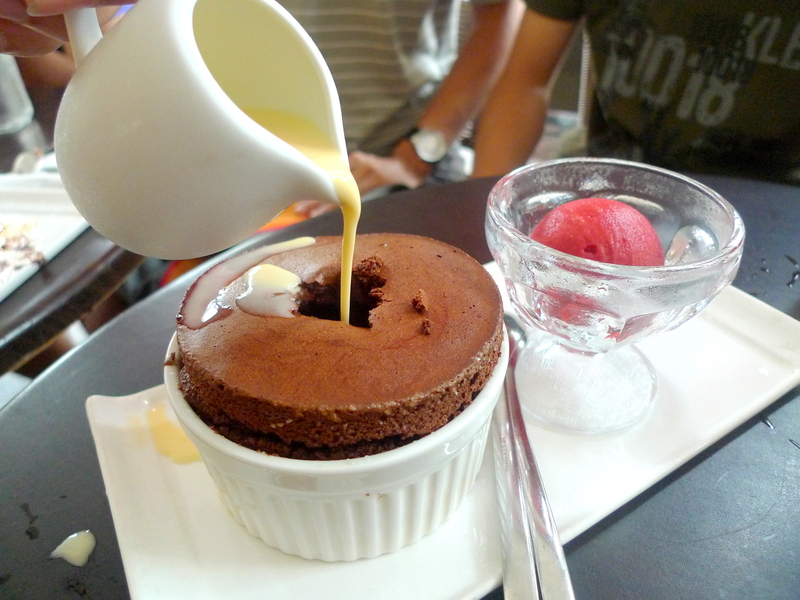 The overly eggy taste and airy and puffy texture of it just turns me off…with the exception of Laurent’s Guanaja Chocolate Souffle($16.50++). It reminds me much of a light chocolate moose, especially when taken with loads of Vanilla Sauce. If I’m not mistaken, the Ice Cream($11/3 scoops) available at Laurent’s is home-made and has only recently(since last Oct) became available on the menu. 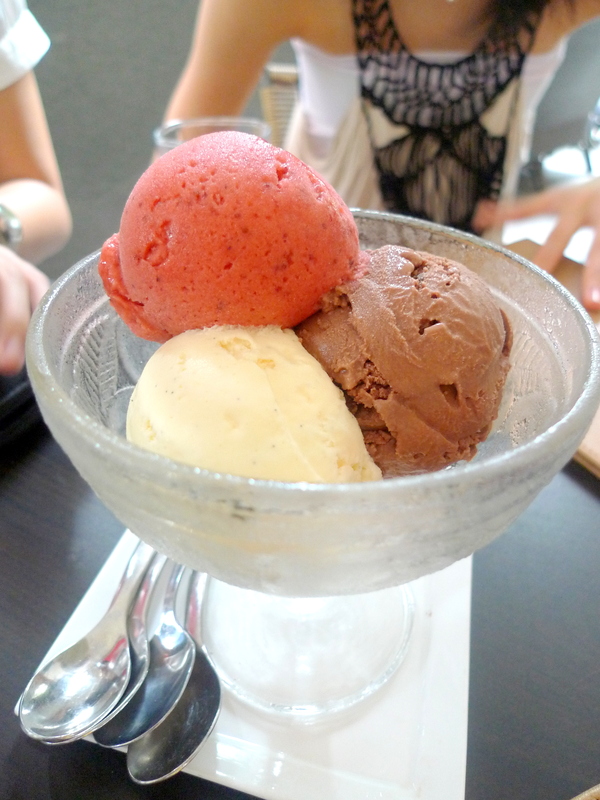 Though it’s not Laurent’s main selling point, the ice cream here is one of my favourites in Singapore. Call me crazy but I will actually rate Laurent’s Ice Cream higher than that of Island Creamery, Tom’s Palette and Ice Cream Chefs, especially the Green Tea and Chocolate(duh!) which are totally awesome! I’m not uploading the picture of the Ice Chocolate because it was quite badly taken and won’t do Laurent’s justice since it’s the best Iced Chocolate I have had! I want some Laurent’s nowwww. nus quite near the portsdown outlet rite? 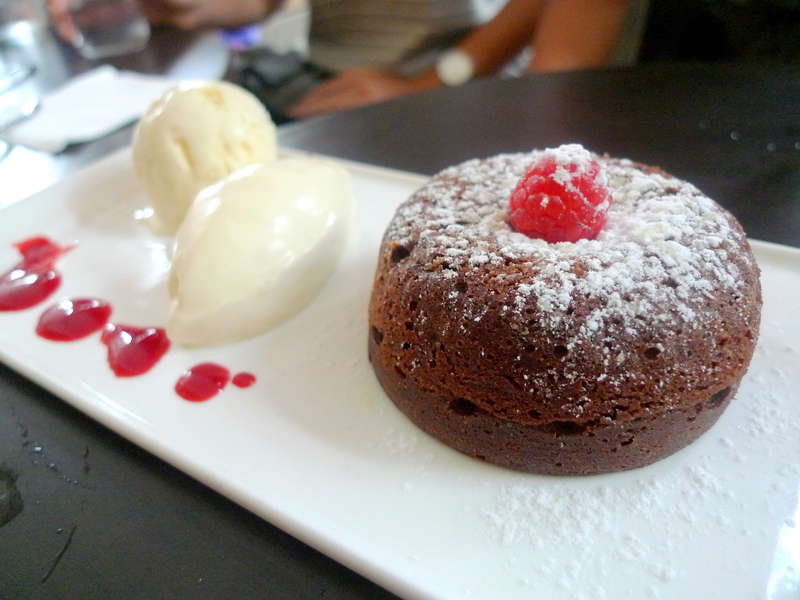 go there get your chocolate fix! yea I share your sentiments! 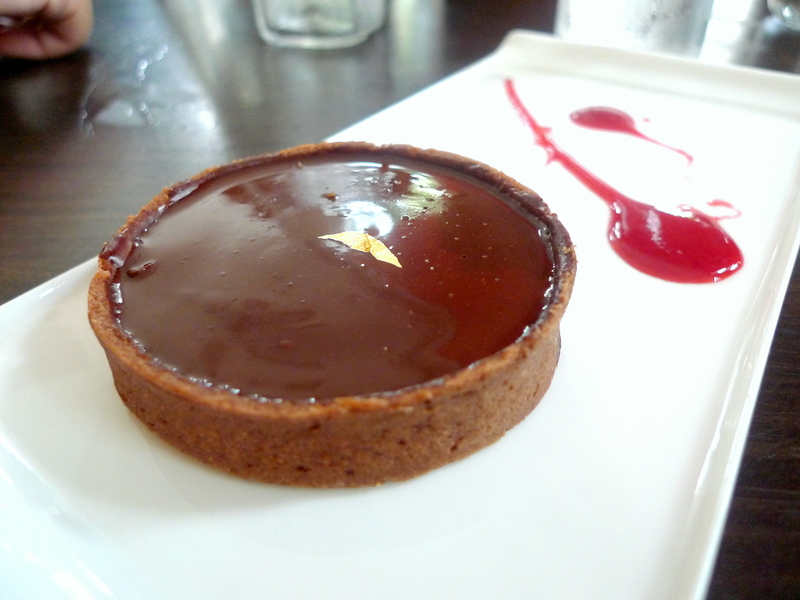 the older version choc tart looks so much prettier than the current one!